Jacques Perritaz is a ruggedly handsome forty-something year old who could easily play the part of the outdoorsy love interest in an ecological doomsday movie. And he doesn't just look the part: until his cidrerie took off, he was a biologist working for the Swiss government on the preservation of natural habitats. He also kept as a side-project a herd of twenty endangered Swiss goats (chèvres bottées), that he rented out to clear brush from isolated pastures (chèvres débrousailleuses). This ended abruptly one winter night when all the goats vanished. Wolves? Some thought as much. The following spring after the snow melted, Jacques found several goat skulls. But they were scattered over miles whereas wolves don't take their food to go, they leave what they don't eat right there on the scene of the slaughter. The sudden disappearance of Jacques' goats remains an unsolved, sinister mystery. Jacques lives in Le Mouret, a small village south of Fribourg on the fringes of "La" Gruyère, the Swiss region where "le" Gruyère cheese and the best cream in the world are made. Wolves aside, it is idyllic. Perched high in the pastures, under pine trees and the snow-capped Alps, isolated chalets watch over black and white Fribourgeoises cows munching lazily on grass and buttercups. It would not come as a surprise if several of the girls in Le Mouret were named Heidi. Since we're on the subject of mythological children, traveling through Switzerland feels very much as if you were Dorothy or Alice or those kids in Narnia: suddenly transported to a strange world --in this case, a never ending succession of landscape postcards, so improbably beautiful they look neoclassical, painted by Maxfield Parrish. The Swiss are very concerned with the preservation of their country's splendid landscapes. At the outset of his biology studies, Jacques found steady freelance work with the government, studying and reporting on the management and preservation of natural habitats, eventually specializing in rare native plants. As fulfilling as this kind of work sounds, Jacques spent a lot of time at his computer typing away at reports. He grew bored and antsy. The goats had provided a first step towards emancipation but he also toyed with the idea of making wine, so he completed short internships with several Swiss wineries. Now, at harvest time, the fruit was left to fall on the ground. Jacques felt bad for the trees. If someone didn't find something to do with the fruit, these ancient selections were bound to disappear. So, in 2000, he knocked on doors closest to some of the trees he has spotted, found their owners, and asked if he could harvest their fruit. This was not a problem. The owners had no use for them. The fruit secured, Jacques bought a small press and a few tanks, and made his first cider. Over the subsequent five years, his cider production grew to about 250 cases annually -- not a career but an increasingly invasive hobby, yet Jacques was convinced there was a possibility of making ciders as interesting as good wine, and that there was a market for them, somewhere. In 2006, Jacques was vacationing in Normandy where he met an old farmer. Their conversation quickly turned to cider (Normandy is France's first cider producing region.) "You should go visit this guy in Hauteville", the farmer raved, "he sells his Poiré for 10 euros!" The farmer thought about the price for a second. "Something's wrong", he added warily. In France, success is often greeted with suspicions of malfeasance. The guy in Hauteville turned out to be Eric Bordelet and the chance encounter changed Jacques' life: "Bordelet was making cider like others made great wine. And he was selling them. It was possible." Jacques borrowed money to invest in equipment, particularly a bottling line (until then he had used an inefficient small hand-bottling contraption) and began producing cider on a commercial scale. Eric, who is normally secretive with other cider producers about his methods, has remained a mentor to Jacques. At the Renaissance des Appellations in Angers in 2015, Eric told us "I usually don't share my secrets with others. But I like what Jacques is doing." The first taste of a Vulcain cider will usually cause disbelief. They are so... pretty! And so different. Dry to moderately sweet, with a discreet salty finish, the different blends or individual varieties speak so clearly yet so delicately --watercolors, not oil paintings. Essentially, these ciders are unmistakably Alpine: at their core is transparency, levity, and altitude; the same cool wind that runs through most Alpine wines; the freshness of a mountain stream, the child of snow. Jacques credits their unique character to his ancient Swiss varieties and how they are grown. He has planted an orchard, but for now all his ciders are produced from the fruit of foraged trees, in the sense that they grow isolated or in small groups. He must find their owners and secure an agreement to buy the picked fruit or harvest it himself. There is now a solid base now of tree owners with whom Jacques has an ongoing agreement, while for others - it depends on their mood. All in all, Jacques processes the fruit of 150 to 200 trees every year. Because there are so many owners, he cannot get organic certification, but all the trees are untreated. They are also all grown haute-tige, literally 'high branches', which was the traditional method used when the trees grew in pastures as part of an ecosystem, rather than in dedicated large orchards. With haute-tige, the branches start high enough from the ground so that cattle can graze under the trees or use them for shade, but not eat their fruit unless it has fallen. The problem with this method is that each tree requires at least 100 square meters to thrive, and their production is irregular, with a good harvest every other year. It's obviously antithetical to industrial production but their fruit is smaller and tastier. Terroir must play a role in the ciders' unique character, but perhaps more the climatic and elevation aspects than the soil itself. Fruit trees are grown in deeper soils than grape vines so the roots do not plunge deep into the bedrock. For the record, the geology is either deep molasses over Valais schist, or moraine gravel mixed with brown clay soil. Certainly, terroir must have played a role in the selection of the ancient varieties grown in the Fribourgeois. The key difference from the French varieties is that the Swiss contain far fewer polyphenols. It is the polyphenols that evolve quickly towards barnyard-like aromas. There is also more nitrogen in the Swiss varieties, which contributes to a quick restart of fermentation after each filtration, thus curtailing the growth of brettanomyces. Jacques' cider mill is located in the basement of an old 19th century tile factory. Though the building is large, his part is a collection of a few unadorned small rooms only: Cidrerie du Vuldain is cidre de garage. After pressing, the juice is clarified for two days. Because Jacques's varieties have less tannin, clarification without intervention is near impossible. He uses an enzyme to facilitate the process, but it is a natural extract of mushrooms authorized for certified organic uses. Fermentation is strictly with natural yeasts in stainless or epoxy tanks. It is vigorous for the first two weeks when it consumes about half the available sugar. At this point, Jacques' true craft begins: tiring the yeasts with two to three filtrations, so that fermentations can proceed slowly, and the juice can eventually be bottled without the adjunction of sugar or yeast to finish its fermentation in bottle where it will produce mousse naturally. Jacques, and this is uncommon, never artificially carbonates his ciders. After the first filtration, the juice is put back into tank. If fermentation is slow to restart, Jacques may add a little of the unfiltered juice he always keeps back as a starter, as in his opinion a slow restart is a vector for brettanomyces growth. 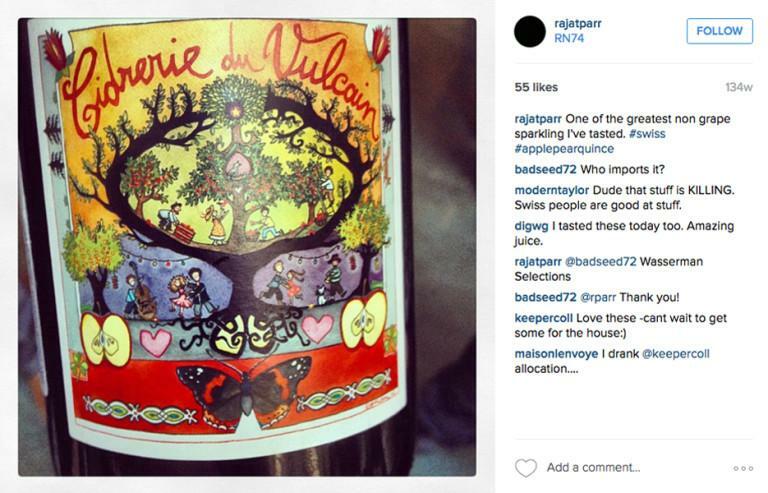 If fermentation needs to be slowed again, Jacques may filter again. All filtrations are light, on Kieselghur diatomaceous earth, the same equipment as used for wine, but Jacques adds (with uncontained exasperation) "The process is much messier with cider." There is usually a final filtration before bottling and an addition of sulfur: he aims for 15 ppm total, well within the 'natural' threshold. No sulfur is added at any other time, however, except when faced with accidents which are rare. Bottling for the sweeter (doux) ciders is usually in January, at a density of 1035; for the off-dry (demi-sec) ciders between January and April at density of of 1025; and usually in April at a density of 1012 for the dry (sec) ciders. He uses a counter-pressure bottling system in order to avoid oxidization, and to keep maximum natural carbonation.